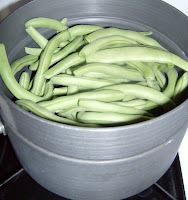 The green beans have only come in dribs and drabs for most of the summer. However, I am finally harvesting them fast enough to serve green beans as a side dish, rather than merely using them as an ingredient in soup. I prefer to eat my veggies with just enough seasoning to highlight their natural deliciousness. Not too much, otherwise the seasonings overpower or muddy the flavor. Sometimes the simplest recipes are the tastiest! Put green beans in a double boiler. Bring water to a boil. Cover with lid and reduce heat. Steam the green beans for 10 - 15 minutes or until they are tender (the time will vary depending on type and thickness of green beans) . They can be a little under done, because they will be cooked some more in the next step. If you don't have a double boiler they can be boiled for 10 minutes instead. Add butter and garlic to a large skillet. Cook over a medium-high heat until the butter melts. Add green beans and pepper; toss gently until beans are coated and heated through. For more garden recipes, visit Grow.Eat.$ave at $5 Dinners.